A post by Will McInerney – Bradford Rotary Peace Fellow 2016-17, class XV and Rotary Liaison Officer. In the midst of the WWI Centenary, Bradford Rotary Peace Fellows embarked on a journey to France and Belgium this past week to learn about the impact of The Great War and to examine the many ways the conflict is memorialized. This post, originally published by Rotary Great Britain and Ireland in 2017, was written by Class XV Peace Fellow Will McInerney based on his reflections from the same trip last year. 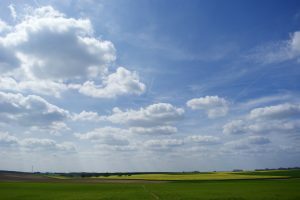 It is a bright and soft spring day in the north of France. The rolling countryside is blanketed in thick shin-high grass that ebbs and flows in the wind. Manicured canola crop plots birth endless streams of golden flowers. It is a sight to be seen. But there are stories buried below the surface here. Looking closely, the scars of snarling trenches splinter the countryside and massive craters lurk between the valleys. From a hilltop, you can spot a peppering of thick iron gated walls in all directions. Fields of graves rest beyond those gates. For every golden canola flower in the wind, there must be at least ten tombstones in the ground. A hundred years ago, this serene setting was the Western Front of World War I. There are perhaps a million or more men buried along this line. I am with a group of a dozen or so foreigners to this land. We are Rotarians and Rotary Peace Fellows from across Europe and North America. Our group is here to learn about what happened and to reflect upon the sacrifices that were made. We tread with reverence along the journey. 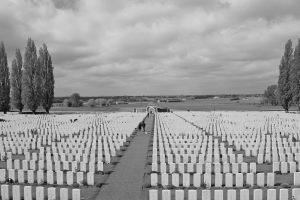 Over three days, we visit a dozen cemeteries and memorials honoring French, Belgian, British, Canadian, West Indian, Australian, American, and German soldiers. 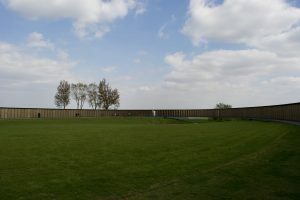 The cemeteries are typically organized by country. Each nation’s section is enshrined in flags and solemn reminders carved into stone. We are physically in France, but the cemeteries take you to another place. For a moment, Vimmy Ridge feels like Canada, and the Arras Memorial is England. The feeling is somber and enveloping. 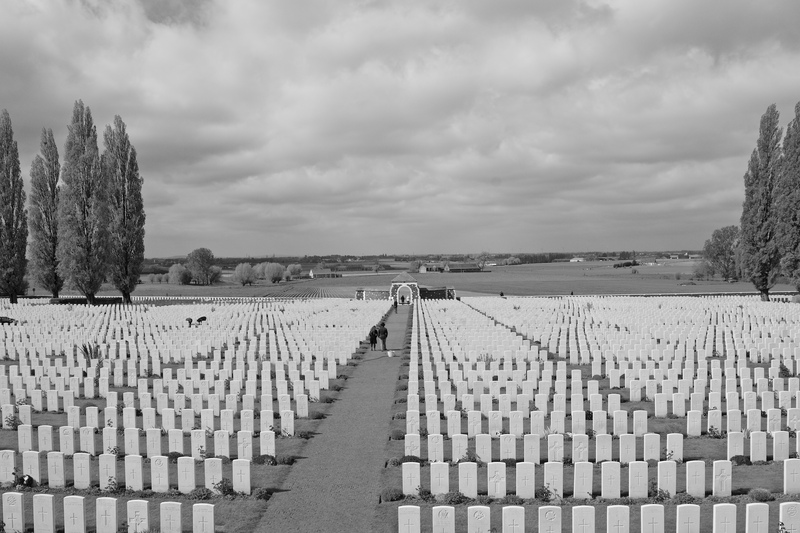 The segregation of cemeteries by country, or by Entente and Central powers, is standard practice. But there is one place along the Western Front that is different. There is one place that it is hard to decipher where you are, or how you feel. At the Notre Dame de Lorette International Memorial, there is a monument to those who died in the Nord-Pas de Calais region; to all those who died, regardless of side or nationality. 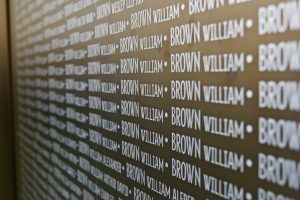 The Ring of Remembrance is a massive elliptical wall with nearly 600,000 names from 40 nations etched into steel plates. The wall is organized alphabetically. Nation and allegiance are removed; all that is left are names. Enemy soldiers are listed side by side encircling each other. As I walk around the ring, I notice patterns in the steel plates. There are hundreds of Martins, and Müellers, and Murphys. 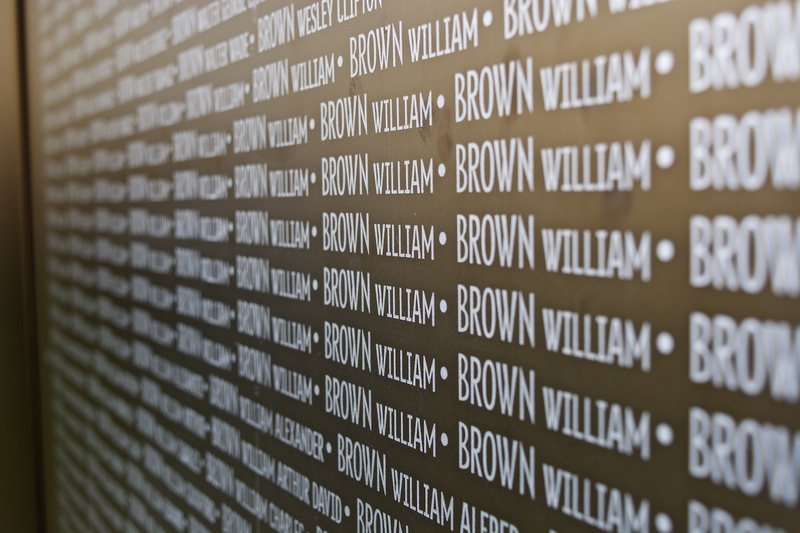 The name William Brown is written 136 consecutive times. Each one is a different man of the exact name. All of them died here. The volume of names is overwhelming. I run my fingertips across the etched walls and try to let the names sink in. My hands stumble upon a familiar pattern of letters about halfway around the ring. My surname is McInerney. It is of Irish origin. 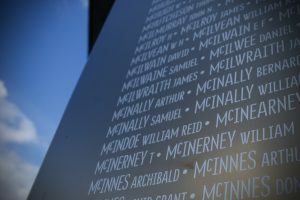 There are a dozen or so McInerneys listed here. A few rows down I spot William McInerney. I press my hand against my own name. The steel plates have a polished finish. My fingerprints are left adorning the letters. As I slowly walk further, the ring eventually comes to a close. But, there is one more spot I want to check. My full name is William Wedel McInerney. Wedel is my mother’s last name. It is of German origin. It too is etched in the wall at the Ring of Remembrance. I do not know the details of my family history beyond a few generations. I do not know my relation, if any, to the William McInerney or the handful of Wedels on the wall. I exit the memorial with a sensation of connection and confusion lodged tightly in my chest. I walk away for a brief moment forgetting who was who, and only remembering that all were human. I walk away remembering the physical and emotional sensation of feeling of my own name, split amongst two warring sides, resting under my fingertips. Each name was cut into the steel exactly the same on the wall. Each name was both distinct and identical. That is a feeling I will never forget. The great Sufi poet Rumi says, “The wound is where the light enters you.” The wounds of the Western Front are still visible. They are scars of history embedded into the French countryside. But as I look around the world today, I wonder if their meaning has been lost in translation. These memorials and cemeteries are not meant to haunt us. Instead, they seek to resurrect history and place it before our eyes so that maybe we can find a new path forward. They try to bring light into our world through the wounds of the past. They ask; how could we, who are both distinct and identical, do this to each other? A question lingers in the air as the golden canola flowers release into the French breeze. World War I, The Great War, the war to end all wars, asks us; what have we learned?